The Colorado Mammoth was without its leading scorer, Adam Jones, and its captain, Dan Coates. 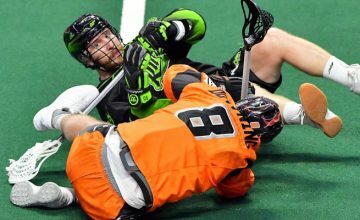 But that didn’t stop the Mammoth from defeating the defending-champion Saskatchewan Rush, 9-7, on HealthONE Field at Pepsi Center on Thursday. Colorado managed twenty fewer shots on goal than Saskatchewan, and didn’t even throw a shot that got to Rush goalie Aaron Bold in the first nine-plus minutes of the game. But Mammoth netminder Dillon Ward kept his team in the contest, shedding 15 shots in the first 15 minutes. And he never looked back! Ward improved to 4-1 on the season and pushed the Mammoth to 5-2 overall, the best record in the NLL. Colorado is now one game ahead of Saskatchewan after ending a five-game losing streak to the Rush (which dated back to 2014). He didn’t steal the show all on his own. Defenseman Ilija Gajic, who scored his first goal of the season five days ago, had two goals in a row in a third-quarter-stretch that saw Colorado bury five straight. “Our coaches give us the green light to run down the floor and freedom to shoot,” said Gajic, who also gathered six loose balls. Rookie Josh Sullivan is another defender who benefited from the coaches’ system, scoring his first-career NLL goal. Defenseman Joey Cupido tallied on a breakaway as well. Forward Eli McLaughlin finished with two goals and one assist, while John Grant, Jr. had a goal and two helpers. Callum Crawford, who leads the NLL in assists, scored one goal and played a role in four others. Chris Wardle scored once as well. 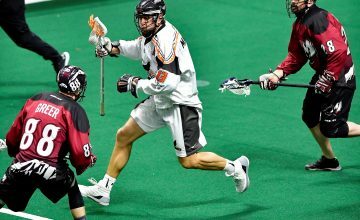 The Mammoth travels to Calgary to take on the arch-rival Roughnecks (3-3) on Saturday at 7pm MT at Scotiabank Saddledome.